Ancient Egypt encompasses one of the most exciting periods in World History. This comprehensive Ancient Egyptian Timeline details the major events significant to lives of the people and Pharaohs of Egypt. The timeline commences at the beginning of the first Ancient Egyptian dynasty with the rule of the Pharaoh King Menes. The Ancient Egyptian Timeline then goes on to chart the great dynasties and the grand Pharaoh Kings of Egypt including Tutankhamen, Ramses and Cleopatra. Dates of all of the successions and deaths of these Egyptian Pharaohs are detailed in the Ancient Egyptian Timeline. Facts and information via the Ancient Egyptian timeline. The Ancient Egyptian Timeline details the important people and events, via a simple timeline, charting the key dates in Ancient Egyptian history. 5550 BC 5550 BC - 3050 BC was the Predynastic Period. Between 5500 and 3100 BC, during Egypt's Predynastic Period, small settlements flourished along the Nile. Before the first Egyptian dynasty, Egypt was divided into two kingdoms, known as Upper Egypt (Ta Shemau) and Lower Egypt (Ta Mehu). The First and second dynasties ruled Egypt and began using hieroglyphics. King Menes aka Hor-Aha whose Horus name was Narmer, is considered to be the founder of the first Dynasty. Memphis, in Lower Egypt, was established as the capital of Egypt, founded around 3100 BC and is the legendary city of Menes, the King who united Upper and Lower Egypt. Djoser established his court at Memphis. The Old Kingdom is famous for the large number of pyramids, which were constructed at this time as the burial places of Pharaohs. 2613 BC The 4th dynasty - The Great Pyramids of Egypt were built at Giza and revered as one of the Seven Wonders of the Ancient World. Sneferu aka Snefru - 2613-2589, the founder of the fourth dynasty, is known to have commissioned three pyramids. The kings from Userkaf 2498 - 2491 through to Pharaoh Menkauhor 2422 - 2414 built temples dedicated to Ra at Abusir. 332 BC Alexander the Great conquers Egypt. Alexander the Great occupies Egypt and his general, Ptolemy, becomes king and founds a dynasty. The city of Alexandria was founded and became famous for the Great Library and the great Lighthouse of Alexandria which was one of the Seven Wonders of the Ancient World. 51 BC 51-30 BC - Cleopatra VII reigns and became the mistress of Julius Caesar and gave birth to his son, Octavian. 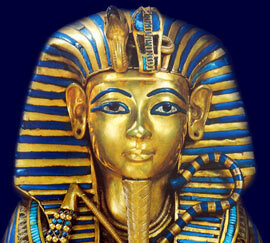 Ancient Egypt encompasses one of the most exciting periods in World History. This comprehensive Ancient Egyptian Timeline details the major events significant to lives of the people and Pharaohs of Egypt. The timeline commences at the beginning of the first Ancient Egyptian dynasty with the rule of the Pharaoh King Menes. The Ancient Egyptian Timeline then goes on to chart the great events of Egypt such as the building of the Pyramids at Giza and the discovery of the Rosetta Stone. Dates of all of the successions and deaths of these Egyptian Pharaohs are detailed in the Ancient Egyptian Timeline. Facts and information via the Ancient Egyptian timeline. The Ancient Egyptian Timeline details the important people and events, via a simple timeline, charting the key dates in Ancient Egyptian history.